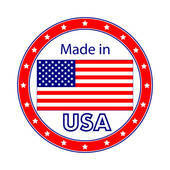 The PAW RIDER™ Pet Seat Belt Adapter is made in the USA out of black leather and comes with a Dual Snap Hook. One snap hook is attached to the PawRider & the other snap hook is attached to the pet’s ChokeFree Pet Shoulder Collar. 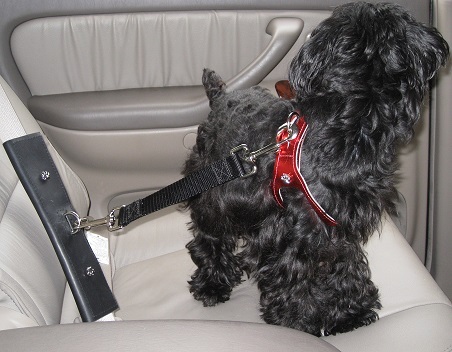 Many pets tend to wander around the vehicle when riding unrestrained. Serious injury to the pet and the vehicle occupants could occur if the pet is unrestrained during sudden stopping or impact with another vehicle or structure. 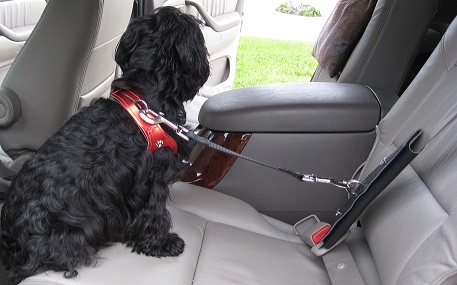 PawRider™ is designed to wrap around an existing seat belt and to keep the pet in the vehicle seat. When the ChokeFree™ Pet Shoulder Collar is used in conjunction with the PawRider™, the pet does not experience pressure against the airway. It is no longer necessary to place a pet in a conventional neck collar or harness and run the risk of putting pressure against the airway. ChokeFree™ can be used for both walking & riding in order to keep the pet from choking. The PawRider™ Pet Seat Belt Adapter is designed to keep the pet securely centered in the seat while riding. The PawRider™ provides an easy way to utilize an existing passenger seat belt to control a pet’s motion while in a vehicle. The PawRider™ easily wraps around an existing seat belt and when the D-ring is placed thru the slotted opening and a restraint snap hook is attached to the PawRider™ on one end and to the D-ring on a pet’s ChokeFree™, the PawRider™ will firmly hold the pet in place. When the PawRider™ is placed around the shoulder portion of the seat belt, it provides a loose control that will allow the pet to pull against the Shoulder Strap and move around as far as the Shoulder Strap allows. When the PawRider™ is placed around a combination of the Lap Belt and the Shoulder Strap, the pet is very restricted and cannot move very far from the PawRider™. When the PawRider™ is attached to the Shoulder Strap alone, the seat belt can be pulled out and tightened in order to restrain the pet as desired. The PawRider™ Seat Belt Adapter utilizes a one piece length of material with hook and loop closure and a D-ring that comes through the slot when the PawRider™ is wrapped around a conventional seat belt. The PawRider™ wrap style design with hook and loop Vel-Lock Closure makes it easy to switch the PawRider™ from seat to seat and from vehicle to vehicle. The method of attachment of the PawRider™ to the seat belt will determine how far the pet can move away from the PawRider™. The PawRider™ will move up and down the shoulder strap depending on the pet’s height and whether the pet is sitting or standing. NOTE: Depending on Personal preference the PawRider™ can be installed on the lap portion, shoulder portion, or lap and shoulder combined. The installation is the same for placing the PawRider™ on just the lap portion or the shoulder portion by not using one or the other. 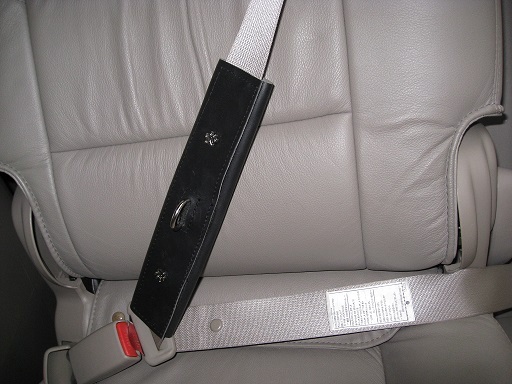 Based on either method of installation of the PawRider™, the vehicle's seat belt can be left as is which means that on most vehicles, the seat belt will continue to let out depending on how much pull is placed on the seat belt. Or, once the PawRider™ is installed, the pet's owner can manually pull out the seat belt strap until it reaches the end and will no longer pull out, and then the pet's owner can allow the seat belt to retract until it is tight. 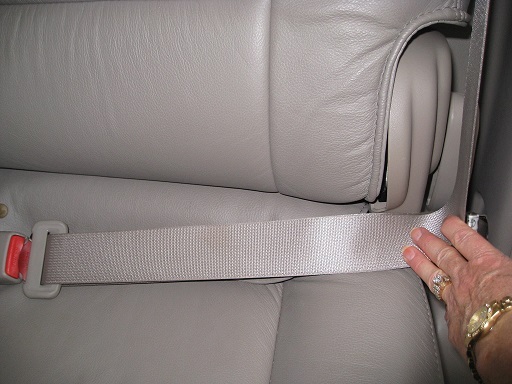 At this point, the pet's owner can tug on the seat belt and it will tighten in place and will not retract or let out further until such time as the buckle is undone and then the seat belt can fully retract. While the seat belt in tightened in place, the PawRider™ will remain in place and will not let out any further and will hold the pet in place. 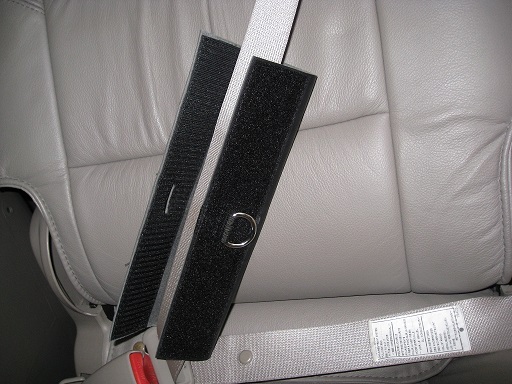 Installation of the PawRider™ Pet Seat belt Adapter is easy. 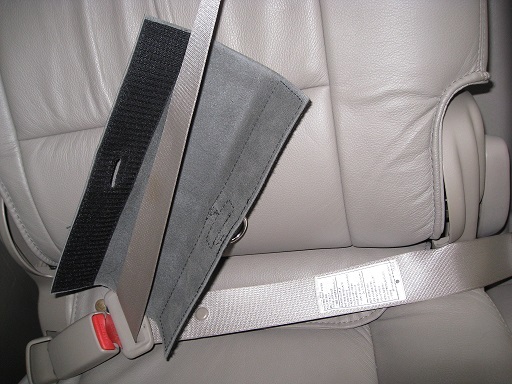 Connect the seat belt buckle. 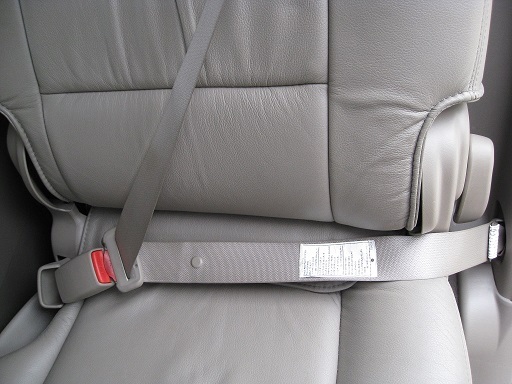 Any seat belt can be used. Note: Caution should be used in the front seat due to the airbag. STEP 1.....Open the PawRider™ and wrap it around the shoulder belt. STEP 2..... Wrap the opposing sides of the PawRider together engaging the hook and loop and placing the D-Ring thru the slot. STEP 3.....Insure that the hook & loop is fully engaged and smooth and the D-ring is protruding thru the slot. Hook one end of the Dual Snap Hook Tether Snap Hook to the PawRider™ and one end to the ChokeFree™. Open the PawRider™ and wrap it around the lap belt leaving it open. Do not engage the Vel-Lock Closure. 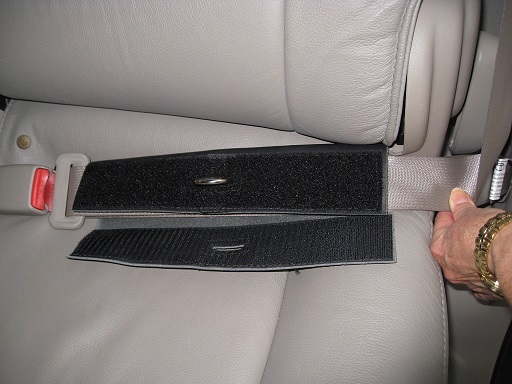 STEP 1.....Pull the shoulder strap portion of the seat belt down on top of the lap portion and wrap the PawRider™ around both the lap and shoulder portion of the seat belt. STEP 2.....Wrap the opposing sides of the PawRider™ together engaging the hook and loop and placing the D-Ring thru the slot. 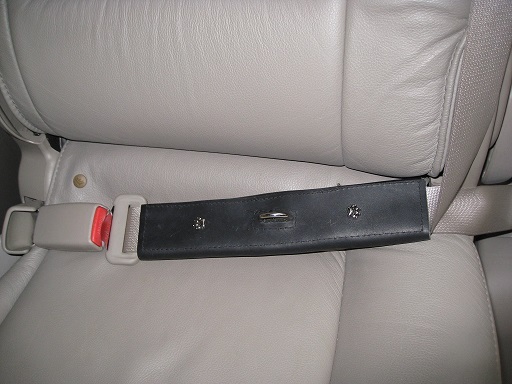 Removal of the PawRider™ Pet Seat Belt Adapter is easy. Unhook the snap hook and remove the tether. Start on the corner of the PawRider™ and lift up on the hook side and peel the hook and loop apart. The PawRider™ in conjunction with the ChokeFree™ Pet Shoulder Collar is the perfect solution to keep pet’s choke free while riding or walking. 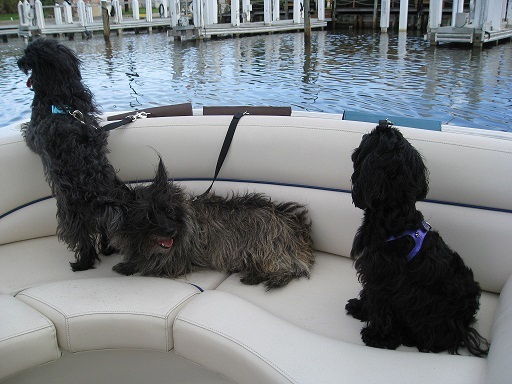 Many pets love to go for a ride on a boat but they tend to wander around the boat while on a boat ride. Pets that are restrained with the PawRider™ remain in place during a boat ride. PawRider™ is designed such that it will wrap around a boat rail in order to keep a pet in place while riding in a boat. Please see the below pictures to see how PawRider™ can be wrapped around the boat's rail in order to keep the pet in place. There are other areas other than the boat rail that may also be suitable for attaching a pet. The PawRider™ design allows it to be placed around any area where the PawRider™ can be wrapped around with the D-ring coming through the Vel-Lock Closure. When the tether is attached to the PawRider™ and the pet's ChokeFree, the pet will remain in place. Please note that pet's should never be left unattended while riding on a boat or other vehicle. Even though the PawRider™ will help to keep the pet in place, the pet may be able to slide over the edge if not being watched. Supervision of the pet is continuously required even though the pet may be restrained with the PawRider™. The PawRider™ assists the pet's owner with making sure the pet is restrained and unable to move around the boat. This is hands down the best seat tether I have ever used! It is easy to install and provides a very secure attachment to the harness. In addition, I cannot say enough good things about this company. I have never had such excellent customer service! I am a customer for life!